What is System.out.println() in Java? What is System.out.println() in Java ? Please see the below example carefully to know about System.out.println() .If you able to understand the example then you understand System.out.println() eaisly. As you know here Test is a class. “s” is a static variable type String. Here “java” is nothing but the value of “s”. Now I am going to print the length(How many character) of “s”. As you know here System(present in java.lang package) is a class. 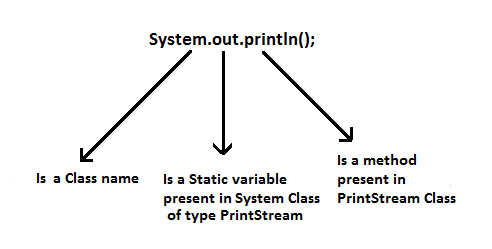 “out” is a static variable type PrintStream. Now see the below example.